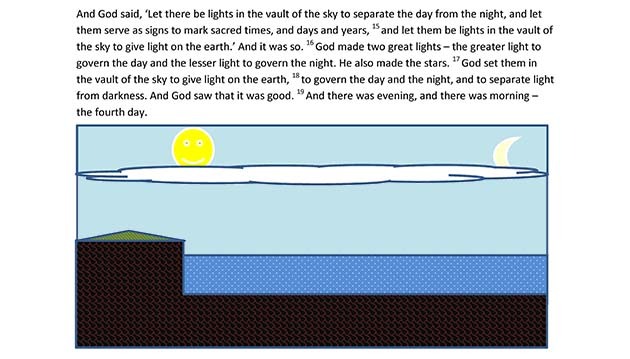 The idea of a vault of heaven is not based on any piece of evidence…Thus to the Babylonians the universe consisted of superimposed layers of the same size and shape separated by space. Our conclusion from the ANE evidence is that the structure of ANE conceptions of the sky is different to that in Genesis 1. There is no one-to-one correlation to be had in any analysis of the different traditions. The differences with Genesis are too great. This raises the question as to why Genesis is not more like ANE mythology. The straightforward theological answer to this question is that, as God chose the nation of Israel above all other nations, so too he taught them in a singular way. As I said in the last post, with no concept of air to scatter light, there was no phenomenological reason to associate light only with the sun, or with any material thing. The blue sky is light (though the meaning of the text has more to do with the function of time, the alternation of light and dark). The separation of waters by something stretched out is the function of this “expanse”. The upper waters are clouds, and the lower become seas. The separator is named “heavens” (shemayim) and contains – nothing, I suggest, the physical separation – the gap – being the essence of what is made. But in order for the separation to happen, the upper waters must be lifted up (since the earth can’t sink), which logically must be into the empty space that was always above the waters. But the “face” of the upper waters must be retained – as it is in the upper surface of the clouds. From hereon it’s conceptually easier – the lower waters gather to reveal the land, whose crowning glory is vegetation. You see here there’s a fudge, in that the heavenly bodies are above the upper waters. Yet we’ve seen that the clouds are the upper waters, open above to the original place where darkness and God’s ruach was. Phenomenologically the sun and moon are above the clouds. It’s only a problem if you believe the Israelites must have thought the upper waters were an ocean, and didn’t know clouds were water, even though many Scriptures show they did. If clouds aren’t upper waters, where are they in Genesis 1? 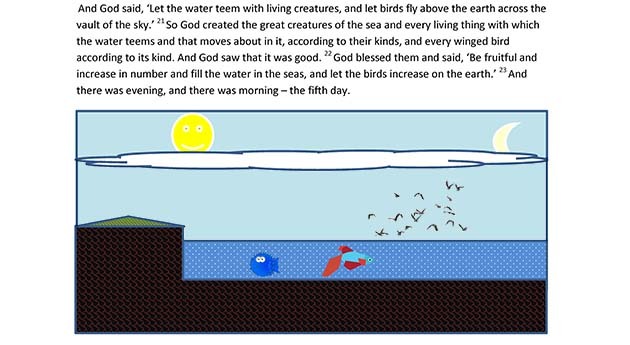 The only point here is that birds are said to fly in the heavens in Hebrew – not below a solid sheet. Incidentally, notice I’ve left the NIV translation “vault of the sky” even though, on any etymology, it’s plain wrong: raqia is derived from a root for “stretch”, which might lead one (wrongly!) to imagine a metal sheet – but never, ever, a vault. that word is derived from the 19th century mistranslation in the Babylonian Enuma elish, transferred across language and culture for a different word root and a different concept! There, everything done except for mankind, which you can imagine. The above scheme allows for God to be called “Most High” from Gen 14 on, and to descend from, speak from, dwell in and otherwise utilise heaven as the highest part of creation, not meaning either “in the air” or “under a boundless ocean”. It also agrees with the Hebrew use of the intensive “heaven of heavens”, ie “highest heaven”, for God’s dwelling. And, of course, it involves no speculative ancient science whatsoever – just a theological (functional and cultic) explanation of what you see out of your window.